People in northern parts of the United States may have an opportunity to cross a line off their bucket list on Wednesday night. 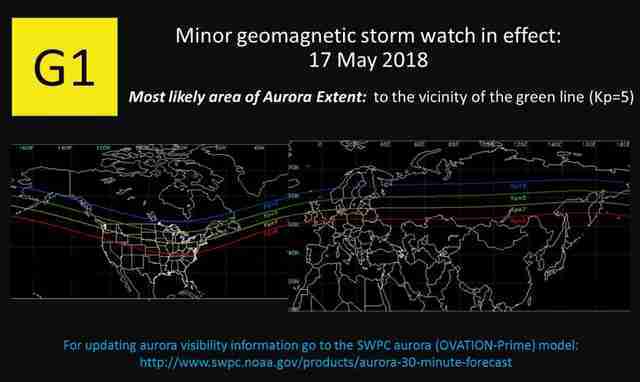 A G1 geomagnetic storm, considered a minor event, is expected early on the morning of May 17 due to "the arrival of a recurrent coronal hole high-speed stream," reports the Space Weather Prediction Center (SWPC). The increased solar winds crashing over the Earth create conditions that can "supercharge" the auroras, making the northern lights visible further south than you'd normally find them. (Especially as we are near solar minimum, a time when the northern lights will be seen this far south with less frequency.) SWPC projections say you might see the northern lights as far south as Maine, Michigan, Minnesota, Montana, North Dakota, and Wisconsin. Below you can see the northern lights over the Mackinac Bridge in Michigan earlier this month, the last time there was a G1 event. Per the SWPC's three-day forecast, your best shot at catching the aurora will be between the hours of 2am and 5am ET. The below map shows the areas around the world the aurora might reach, designated by the light green line. To have the best experience (and increase your chance of catching the show), you'll want to get out of town away from city lights to an area where you'll have an unobstructed view of the northern horizon. You'll also want to check the forecast to make sure there's a clear night ahead of you. You're most likely to see the kind of hazy glow found in the video above rather than the brilliant well-defined ribbons seen in videos of the aurora borealis from places like Alaska, Iceland, or Finland. If you can't go out tonight and want to track down the aurora on another night, the SWPC's 30-Minute Aurora Forecast is a handy tool to see where the aurora may show up on any given night. However, it's worth getting out when the opportunity arises. 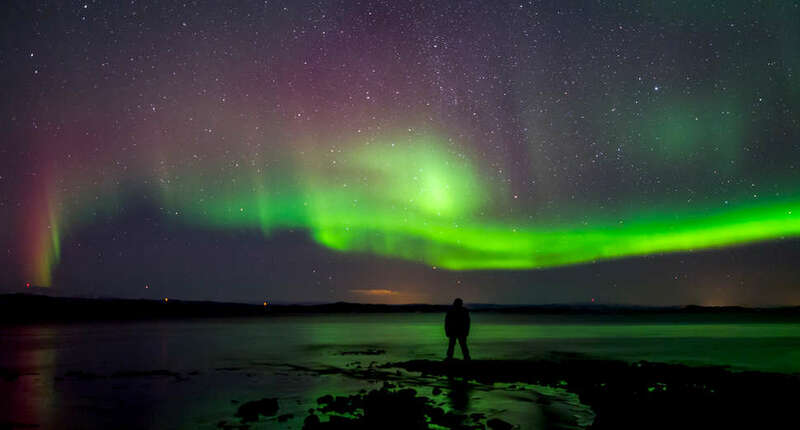 The solar cycle is near solar minimum, which means there will be fewer opportunities to see the northern lights this far south over the next handful of years.